With record rainfall levels across the state in the last 7 days, the Whitsundays community launched its own campaign to counteract the sensationalist media reporting supporting the rain event. Local businesses and community groups got together throughout the week to show how wonderful the region can be in the wet season. From a community ‘walk in the rain’ (note: no rain jackets or umbrellas allowed) to it raining Pina Coladas on Friday, the Whitsunday community gave visitors and locals alike some great events to get involved with. 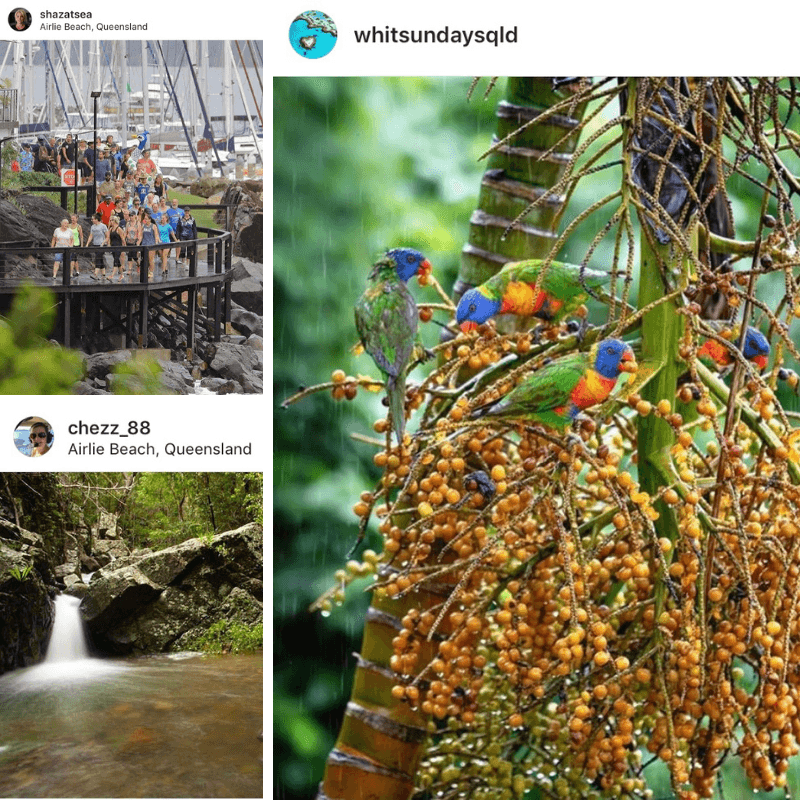 The natural beauty of the region has also taken centre stage across Instagram in the last week with images of lush rainforest, cascading waterfalls and locals and visitors frolicking in the rain! Become a book worm. Head to Ocean Club and pick up a good book from the book swap. Make a fresh pot of coffee and settle down for an afternoon of reading indulgence. Walk in the rain. Get the wet weather gear on and head to the Airlie Creek walk at the back of Airlie Beach. It will take approximately 1.5 hours from the marina to the summit and back. The creek itself is raging and the rainforest lush and green. Enjoy a warm shower in our private amenities on your return! Enjoy a long lunch. Sorrentos Bar & Restaurant in the north village has a huge undercover balcony and serves lunch 7 days a week. Pull up a stool, order a delicious lunch and sit back and enjoy the rain show! Go to the movies. A drive to Bowen on a rainy day isn’t too bad and the Summergardens Cinema at Queen’s Beach shows great new releases in quaint classics movies theatres. Give it a try! They say spring is the time for cleaning, but rainy days can be perfect to. Empty those cupboards, clean the bilges, or rearrange lockers whilst the weather is wet, you will be grateful you did when it dries again! It is important to remember that summer in the tropics is the wet season and our ecosystems rely on this rain to regenerate and survive during the cooler dry months of the winter. Enjoy the rain while we have it!